Residents of Kitakata, a northwestern Fukushima Prefecture city known for promoting antiquated Japanese kanji, are stepping up efforts to attract more tourists by linking the pictographs to sake breweries in the area. Kitakata wo Kanji no Machi ni suru Kai, a citizens’ group promoting pictographs created some 3,000 years ago, is preparing walking courses to encourage people to visit breweries in the city. They hope that tourists on the walking courses will join games to check signboards bearing an ancient character symbolizing each brewery and come up with words by putting the characters together. The group, which has been setting up antiquated-kanji signboards at stores and creating walking courses to visit them, now plans to create three new courses focusing on breweries to attract more tourists. Participants in the walking tours, expected to start in spring, will visit breweries — some of them not usually open to the public — and will be provided with a special ochoko (small cylindrical cup) to sample sake at the sites. Currently, there are some 220 such signboards set up in the city, with the group planning to set up more at breweries that lack them. According to the Kitakata Municipal Government, the average time tourists spend in the city is about four hours, more than an hour shorter than the average spent at other major tourist sites in the nation. The municipal government hopes to promote visits to the breweries along with trips to popular Kitakata ramen shops, so that tourists will spend more time in the area. 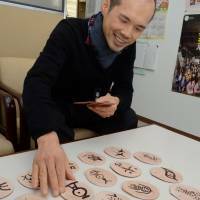 In an expansion of activities first started by the late Masami Takahashi, an engraver of antiquated kanji, the citizens’ group, headed by 38-year-old Masahiro Ueno, has also created cards featuring the kanji characters, which will be put on sale and used at the group’s events to make children more interested in kanji. Takahashi’s family plans to turn his workshop in central Kitakata into a gallery that will be open to the public by the end of this month to realize his long dream of creating a place that educates people about kanji. “We members hope to tread in his footsteps and work together to promote the city by combining kanji and tourism,” Ueno said. This section appears every third Monday and features topics and issues covered by the Fukushima Minpo, the largest newspaper in Fukushima Prefecture. The original article was published on Jan. 4.